Nothing says "take me seriously" like a kiddy sized yellow lego brick backpack. This was a birthday gift from The Phamly because I needed a bag for work. Clearly, they respect my profession even though they don't actually know what I do. To be fair, I don't think anyone knows what I do. Today I was introduced as "Jade...she does a lot." Well, this do-a-lotter goes to work in sneakers, shiny street wear and most days with unbrushed hair so The Phamly got me a work bag to match. The Lego backpack has one main compartment that can fit a stack of about 10 x A4 notepads and is a rectangular lego brick shape. The six lego connectors on the front are individually zipped pockets. I keep USBs, hair ties & pins, lens cleaners, girl things, mixed nuts and lip balm in mine. There's a nifty drink bottle holder on the left. 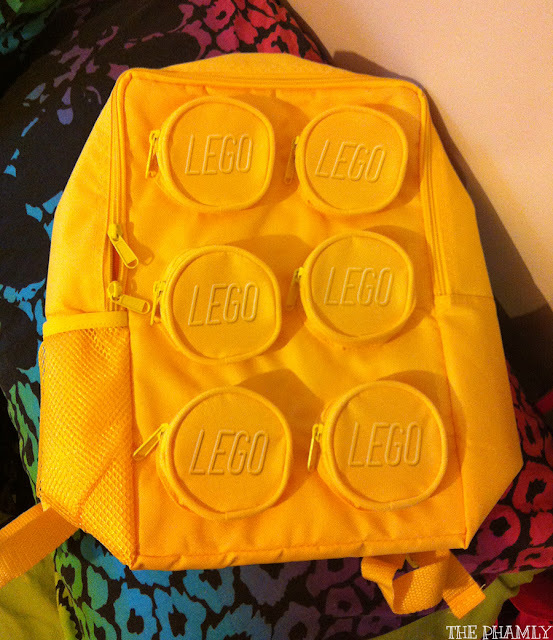 This backpack goes with my Lego Stationery Kit. Yep, people take me very seriously around the office.